This week on Fieldstone Common our featured guest is Richard DeLuca, author of the book Post Roads and Iron Horses: Transportation in Connecticut from Colonial Times to the Age of Steam. Richard DeLuca earned a Bachelor of Civil Engineering degree from Manhattan College in New York, and a Master of Science degree in transportation planning from the University of Connecticut at Storrs. He has ten years of experience in the field of engineering as a transportation planner with the Connecticut Department of Transportation and with the Central Connecticut Regional Planning Agency. In 1978, he moved to San Francisco, after which he pursued a career as a writer, focusing on California history. He was a member of the California Historical Society, a volunteer teacher in the Society’s docent program, and past president of the Society’s docent association. His article on the Indian occupation of Alcatraz Island and the origins of the Native American civil rights movement was published in California History, and received the society’s Alice J. Clark award for twentieth-century history in 1984. He and his wife returned to Connecticut in 1998. For the past ten years he has been at work on a two-volume history of Connecticut transportation from the colonial period to the present. 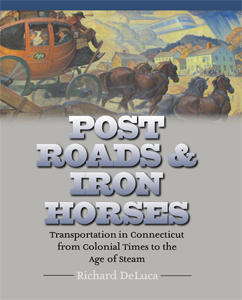 The first volume, Post Roads & Iron Horses, was published by Wesleyan University Press in December of 2011, and covers the history of Connecticut transportation from colonial times through the age of steam. A second volume on transportation in the twentieth century is in progress. 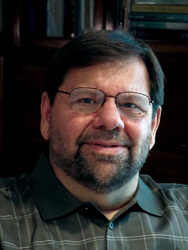 He has presented his research at several history conferences, including the Dublin Seminar, and published several articles in Connecticut History, the journal of the Association For The Study of Connecticut History. His latest article, Competition v. Monopoly: Transportation and the Law in Nineteenth Century Connecticut, appeared in the fall 2010 special issue of Connecticut History celebrating the 375th anniversary of the state’s founding. He also served as the membership chair for ASCH from 2003 to 2005, and is currently on the editorial board of Connecticut History. You can contact Richard through the publicist at the Wesleyan University Press. Post Roads & Iron Horses is the first book to look in detail at the turnpikes, steamboats, canals, railroads, and trolleys (street railroads) that helped define Connecticut and shape New England. Advances in transportation technology during the nineteenth century transformed the Constitution State from a rough network of colonial towns to an industrial powerhouse of the Gilded Age. From the race to build the Farmington Canal to the shift from water to rail transport, historian and transportation engineer Richard DeLuca gives us engaging stories and traces the significant themes that emerge as American innovators and financiers, lawyers and legislators, struggle to control the movement of passengers and goods in southern New England. The book contains over fifty historical images and maps, and provides an excellent point of view from which to interpret the history of New England as a whole. Hardcover; 251 pages with 3 appendices, end notes, a bibliography, an index and lots of BxW photos and illustrations. Post Roads and Iron Horses is available for purchase from Amazon.com and other booksellers. A discussion about transportation in Connecticut is a really a discussion about transportation in the Northeast. Connecticut is a main corridor for travel between New York and Boston. Likewise much travel northward to Springfield, Massachusetts, Vermont and New Hampshire happened via the Connecticut river. In this interview we talk about everything from Native American footpaths to town and country roads to steamboats, canals and, of course, iron horses (trains). We discuss how people reacted to the arrival of railroads and the change from “local time” to standardized time because of train schedules. For more on the discussion of standardized time, Marian recommended checking out a recent episode, “On the Clock: A (Brief) History of Time” from the program Backstory with the American History Guys. Two copies of Post Roads and Iron Horses were given out to the Fieldstone Common audience courtesy of the Wesleyan University Press. This entry was posted in Connecticut, Transportation, Wesleyan University Press and tagged Richard DeLuca; Post Roads and Iron Horses by FieldstoneCommon. Bookmark the permalink.